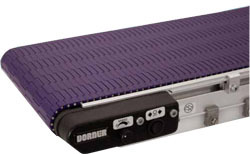 Dorner is a Leader in the design, applications, manufacturing, and integration of conveyor systems. Companies from over 1,200 different industries worldwide turn to Dorner to achieve improved efficiency, productivity, and a positive ROI. Dorner offers the broadest range of unit handling conveyors in the world, moving everything from machined parts to raw food products. The Heavy Duty 3200 Series conveyor is available i3 formats: Flat Belt End Drive, Cleated Belt End Drive, and Center Drive models. 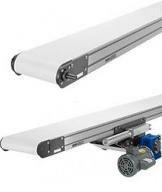 Dorner’s line of sanitary conveyors are designed to improve your food safety. With Dorner’s hygienically designed conveyors, you can have confidence in your food handling equipment and less worry about product quality. Features such as removable wear strips, belt lifters and frame cut outs allow fast access to the conveyor frame, meaning these conveyors clean up two times faster than the competition. The 7X series of conveyors, also known as our AquaGard and AquaPruf platforms, take food handling conveyors to a whole new level. Designed for fast and effective sanitation and protection from contamination, 7X line provides the same Dorner quality and flexible designs as all our systems. Dorner is also proud to offer the only USDA certified conveyors in the industry: the AquaPruf 7400 Ultimate and 7600 Ultimate. They are the only modular conveyor on the agency’s list of accepted equipment for the meat and poultry industry. Dorner’s Pallet System conveyors simplify product flow and control with features such as a unique pin tracking system, industry compatible pallet sizes and innovative modules. 2200 Series Precision Move Pallet System conveyor and the SmartFlex Pallet Systems are advanced in pallet traffic management and are specifically designed to increase efficiency, reduce downtime in automation processes, and provide the accurate conveying. When floor space is tight and applications call for product to be moved up or down, Dorner’s trio of SmartFlex curve conveyors are the perfect answer. The SmartFlex Helical Curve, Spiral, and Alpine conveyors greatly expand the capabilities of Dorner’s SmartFlex line by giving customers the ability to move product up or down and around equipment to accommodate tight spaces. Dorner’s SmartFlex line is a flexible conveyor platform that reduces costs, saves time and offers simple configuration and acquisition options to Dorner’s customers within the packaging, medical, health and beauty, industrial automation and electronic industries. R.R.Floody Company is a Dorner Conveyor distributor in Northern Illinois, Iowa and Southern Wisconsin. We offer technical support to help our customers solve their applications.